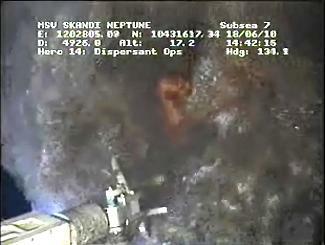 NEW ORLEANS, Louisiana, June 18, 2010 (ENS) – The amount of oil spewing from the broken BP wellhead in the Gulf of Mexico is likely 35,000 barrels per day, National Incident Commander U.S. Coast Guard Admiral Thad Allen said today, based on a new estimate from the Flow Rate Technical Group. He said BP’s containment system captured about 25,000 barrels yesterday, the largest daily amount collected since the well was partly capped earlier this month. The National Incident Command’s Flow Rate Technical Group, which includes both government and independent scientists, has issued an “improved” estimate of the flow rate from the damaged well that ranges from 35,000 up to 60,000 barrels per day. Admiral Allen said that based on his best assessment of the situation, he believes the actual flow rate is at the lower end of the new estimate. “We anticipate by the end of the month of June the capacity will increase to about 53,000 barrels a day,” he said. The first flow rate estimate announced by the Flow Rate Technical Group at the end of May ranged from 12,000 to 25,000 barrels per day. That far surpassed BP’s earlier estimate of 5,000 barrels per day. The improved estimate is based on more and better data that is now available and that helps increase the scientific confidence in the accuracy of the estimate, said Energy Secretary Steven Chu, Interior Secretary Ken Salazar, and Dr. Marcia McNutt, director of the U.S. Geological Survey, who chairs the Flow Rate Technical Group. 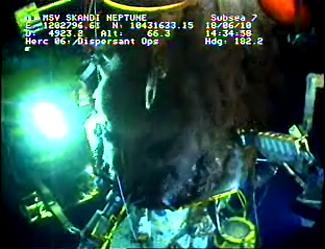 The improved flow rate estimate brings together the work of several scientific teams and is based on a combination of analyses of high resolution videos taken by remotely operated vehicles at the wellhead, acoustic technologies, and measurements of oil collected by the oil production ship together with pressure measurements inside the containment cap now in place over the damaged wellhead. “This estimate brings together several scientific methodologies and the latest information from the sea floor, and represents a significant step forward in our effort to put a number on the oil that is escaping from BP’s well,” said Secretary Chu. “We need to have accurate and scientifically grounded oil flow rate information both for the purposes of the response and recovery and for the final investigation of the failure of the blowout preventer and the resulting spill,” said Salazar. “This estimate, which we will continue to refine as the scientific teams get new data and conduct new analyses, is the most comprehensive estimate so far of how much oil is flowing one mile below the ocean’s surface,” Salazar said. The containment cap can capture up to 18,000 barrels of oil per day. At the direction of the federal government, BP this week a second containment option, a mobile offshore drilling unit called the Q4000, which expands total leak containment capacity to 20,000-28,000 barrels per day. 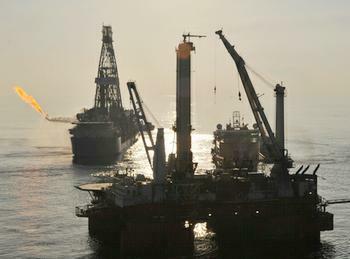 Admiral Allen and BP both said that on Thursday the total oil recovered was approximately 25,290 barrels. The total oil recovered from both the containment cap and Q4000 systems since they were implemented is 204,200 barrels – oil that did not enter the waters of the gulf. Admiral Allen explained Thursday that the Q4000 is flaring off both natural gas and oil. “There’s an EverGreen burning device on the Q4000 that looks much like the flaring device for natural gas but it’s capable of flaring the oil itself with natural gas in it, a fairly clean burn. Not nearly what the amount of smoke that you see for an in situ burning,” he said. “We’ll look at, further down the line, the ability to actually transfer that oil ashore and actually offload it. But for now, it’s giving us several thousand more barrels a day capacity and that’s several thousand barrels a day that’s not going into the environment,” he said. At the direction of the federal government, BP is implementing multiple strategies to expand the leak containment capabilities at the sea floor beyond the upper level of the improved estimate. Overall, the leak containment strategy that BP was required to develop projects containment capacity expanding to 40,000-53,000 barrels per day by the end of June and 60,000-80,000 barrels per day by mid-July. Admiral Allen described how the higher containment capacity can be achieved by replacing the containment cap with a tight-fitting “absolute” cap that will allow no oil to escape and shifting from fixed to floating oil production platforms. BP is bringing in large floating production platforms from the North Sea and from Brazil. These floating platforms take the oil, separate the gas and oil and then ship the oil to shuttle tankers that are moored alongside that take the oil ashore. In the Gulf now, produced oil is transferred to shore through pipelines laid along the bottom of the ocean. “To make this operation work,” said Allen, “we’re going to have to put up a flexible moorings and riser pipes that have flexible hoses coming from the well to the [4,000-foot long] riser pipes and then from the top of the riser pipes to the production platforms.” This system will make it possible to disconnect from the wellhead in the event of a major hurricane and then reconnect once the hurricane danger has passed. But the admiral warned that the time estimates for this system to be in place could vary. Admiral Allen said drilling of the relief well – the solution that is expected to kill the leaking well for once and for all – is proceeding ahead of schedule and could be complete before the end of July.